The first of Art Asylum's C3 building sets are starting to reach store shelves, and the line is just as good as the preview set made it seem. This set is the Batglider, a smaller, more navigable craft than the oversized Batwing. It's basically a tarted-up hang glider, with a few additions. The basic outline is, of course, that of a bat, as you would expect. There are two little handles that Batman can grasp to keep him in place. The wings move at two points each - they can rotate at the point where they attach to the body, and they're hinged in the center. Between the two, you can really make the glider look like a giant bat flapping its wings. There are two free-floating turbines in the wings that not only spin, but also turn relative to the surface of the wings - I guess they stay level to the ground to help provide lift. 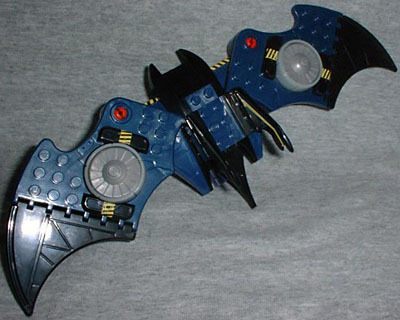 Assembled from 69 pieces, the finished Batglider measures 3 1/2" long and has a 10 1/2" wingspan. It's constructed mainly from dark blue bricks, with a few bright colors for contrast. There are no decals to apply - everything was painted on at the factory. This set includes two DC Minimates. The first figure is Stealth Batman, though you never really think of "regular" Batman as being unstealthy. He's wearing a purple costume that was inspired by the type of gear HALO jumpers wear - lots of straps and buckles, and no exposed skin. His mask has a respirator and a pair of goggles, and he's got a light brown harness that is a removable piece. Like the exclusive Stealth Batwing, this set includes extra pieces to turn the Batman figure into a more standard version: a mask, chest piece and a cape that fit onto the figure. 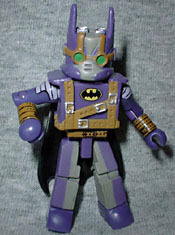 Of course, since all those pieces are black and the base figure is purple, it really doesn't work out too well. 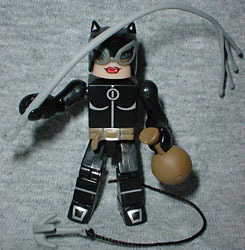 The second figure in the set is Batman's longtime antagonist, Catwoman. She's gone through a lot of costume changes over the years (and probably just as many changes in personality/motivations), and this little figure represents her newest look. It's really a good design, and suits her burglar nature - dressed in an all-black costume, she's ditched the dresses and spandex in favor of more sensible leather. Instead of thigh-high boots, she's got a normal pair that could almost pass for Doc Martens. To top it off, Catwoman's got a cool pair of cat's-eye lenses on her mask. 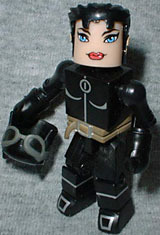 This Minimate is the first figure to get Selina's new costume - sure, DC Direct has one coming, and there's a Microman version in production, but Art Asylum got her out there first, and did a damn good job of it. A separate piece at her waist duplicates the way she wears her whip tied around her as a belt, and she's got new, unique hands to represent the claws on her gloves. The mask is particularly good - rather than just give her solid lenses, you can see her little eyes in there. As first I thought they were just painted on, but no; the lenses in the mask are actually clear enough to see through. The whole piece was molded from translucent plastic, then the "solid" parts were painted black. It's a very nice choice, and Art Asylum pulled it off well. There are a few accessories for the figures, which adds to the play value. Batman has a hinged batarang, while Catwoman gets a grappling hook, her whip and a bag of loot. So that she can hold onto her ill-gotten gains, the bag has a little pull-out handle that can fit in the Minimate hand. Leave the piece extended, and you've turned the bag into a priceless vase. The C3 sets are definitely fun, and Art Asylum has done a great job with them. After the Star Trek fiasco, it's good to see this small company back on the shelves of the Big Five. Though a lot of people will probably be buying the sets just for the figures, they'll find that the construction sets are just as good, too.